Google is by no means perfect when it comes to issues relating to gender, but it’s clear the company is trying. 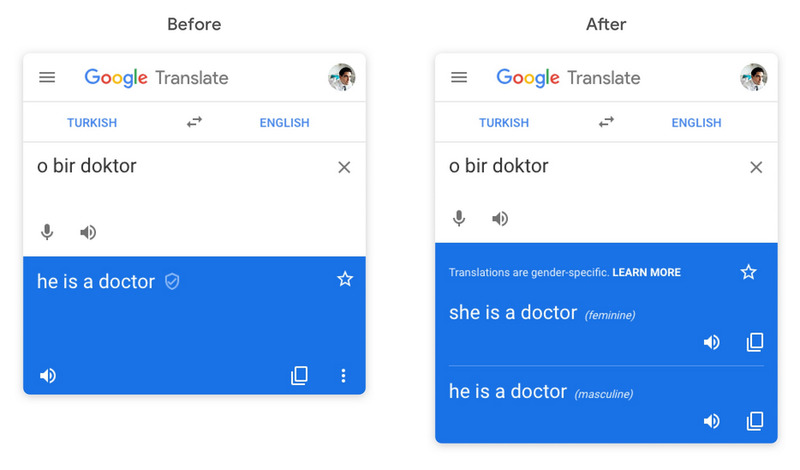 Google recently made some important changes to its Translate tool — reducing gender bias by providing both masculine and feminine translations for gender-neutral words. Previously, Google would default gender-neutral words to the masculine form. This comes after Google has been specifically called out for its biases in translate and autocomplete. Back in February, Forbes reported how examples of gender bias in Translate began popping up on social media. Now, Google will offer both feminine and masculine translations for single words when translating from English to French, Italian, Portuguese or Spanish, as well as when translating from Turkish to English. Down the road, Google says it does plan to address non-binary gender in translations. Google will also eventually bring this to its iOS and Android apps, and address gender biases in auto-complete.